Since it first opened on Broadway in September, 1964, Fiddler on the Roof has constantly been onstage somewhere, including five Broadway revivals, four productions on London’s West End and thousands of schools, army bases and countries from Argentina to Japan. Barbara Isenberg interviewed the men and women behind the original production, the film and significant revivals– Harold Prince, Sheldon Harnick, Joseph Stein, Austin Pendleton, Joanna Merlin, Norman Jewison, Topol, Harvey Fierstein and more– to produce a lively, popular chronicle of the making of Fiddler. Published in celebration of Fiddler’s 50th anniversary, Tradition! 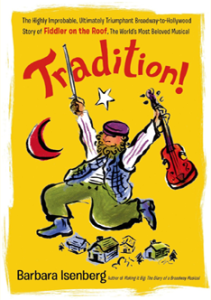 is the book for everyone who loves Fiddler and can sing along with the original cast album. “Barbara Isenberg’s history of Fiddler on the Roof, from Sholom Aleichem’s Tevye stories to Norman Jewison’s film and beyond, is definitive. I can’t imagine anyone covering the subject more fascinatingly or eloquently. As someone who was lucky enough to be part of the saga, I applaud Tradition!”—Hal Prince, producer of Fiddler on the Roof onstage. Culling the most candid, revealing, and entertaining interviews from her twenty years of talking with Frank Gehry, Barbara Isenberg gives us an intimate portrait of our most influential architect. In Conversations with Frank Gehry, Isenberg covers every aspect of his career: his early formative influences, work process, artistic influences, inspiration, business, art and artists. Subjects include his childhood spent building cities from blocks on his grandmother’s floor, winning the Walt Disney Concert Hall competition, and touring Bilbao for the first time. He divulges his frank opinions of other architects, including Frank Lloyd Wright, Le Corbusier and Rudolf Schindler. In addition, illustrations, including early sketches and models, and computer renderings allow us to see Gehry’s thoughts unfold, step by step. 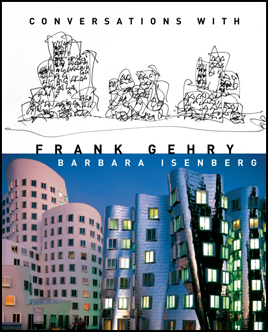 “I’ve written about many of [his] endeavors, interviewing Gehry again and again for newspapers, magazines, and books since the 1980s,” writes Barbara Isenberg in her Introduction. “A few years ago, he asked me if I would help him organize his memories through an oral history. I was immediately drawn to the idea, having enjoyed our earlier interviews, and what began as an oral history soon evolved into the conversations I’ve edited here.” Conversations with Frank Gehry is an unprecedented look into the life and work of a brilliantly creative, amusing, and articulate man. 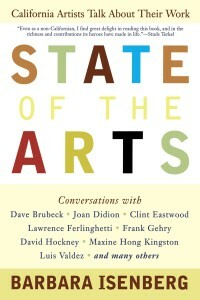 State of the Arts chronicles the link between creativity and place through conversations with more than 50 California artists both well-known and lesser-known. Musician Dave Brubeck, novelist Maxine Hong Kingston, artist Alexis Smith, and writer Joan Didion all were born in California. David Hockney calls himself an “English Los Angeleno” while Toronto-born Frank Gehry got here and essentially changed the way we look at architecture not just in California but around the world. Poet Lawrence Ferlinghetti, novelist John Rechy, director Peter Sellars, artist Judy Chicago and so many other creative people grew up across the country or across the world but eventually came to California to paint or to sculpt, to compose music or to write novels. Edward Weston once said everything worth photographing was in California. How does one of Broadway’s most anticipated musicals end up folding its tent after just six months and with a potential loss of more than $10 million? In Barbara Isenberg’s behind-the scenes account, readers follow step by step as the musical Big struggles against nearly insuperable odds. The long-awaited stage adaptation of the popular Tom Hanks film did not have an easy journey, and in this authoritative, insightful and readable journal, we go backstage as the $10.3 million production is cast, rewritten, rehearsed and performed, first in Detroit, then in New York. Doors are opened to high-pressure rehearsals, passionate advertising debates, stern budget talks and endless rewrite sessions in out-of-town hotel rooms. Making It Big illuminates the harsh realities of musical theater, a much-beloved but high-stakes, high-risk art form. 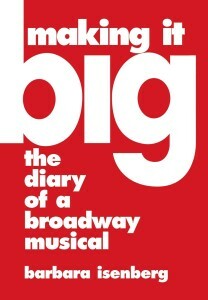 It is a book for everyone who cares about Broadway musicals.